Carol was honored for her innovative work by the 2001 Genesis Awards and as A Hero for The Planet by TIME magazine. She has been the subject of recent features in The Chicago Tribune, People, The New York Times Magazine, and CNN, and has authored two children’s books on elephants. Carol attended the Exotic Animal Training and Management Program at Moorpark College in California. 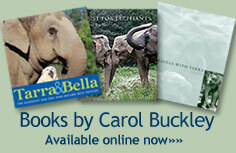 Carol is a well-known speaker on the subject of elephant care. If you would like to inquire about services for your organization, submit an inquiry. Education and hands-on assistance to end the worldwide suffering of elephants. Working with scientists, veterinarians, mahouts, elephant caregivers and elephant welfare supporters, EAI is helping to change how the public relates to elephants; how mahouts and elephant caregivers train elephants; and how captive elephants are cared for worldwide. Provides assistance for elephants nationally and internationally. Facility and elephant health and welfare evaluation for zoos, private owners, NGO’s and government forest departments in Nepal, India and Thailand. Documented and reported on the foot health, facilities and management of 197 captive-held elephants in Nepal and India. 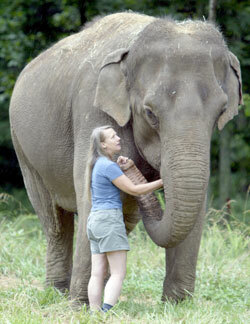 Arranged for the release of and provided care for 24 elephants at the Sanctuary over 15 years. Developed Passive Control, a non-dominant elephant management system designed to meet elephant needs while insuring their autonomy. Worked with elephant care professional to develop and implement an integrative holistic approach to elephant medical care. Developed and oversaw the administrative office, hired and trained caregiver staff. Designed and produced educational programs for the public. Worked with governmental agencies and private organizations to strengthen regulations pertaining to the welfare of captive elephants. Spoke as an expert witness in defense of sound science regarding elephant welfare. Coordinated the rescue of the first elephant ever confiscated by the United States Department of Agriculture; placed by the agency at The Elephant Sanctuary in 2003. Provided assistance for elephants nationally and internationally. Traveled in the US, Canada, and abroad performing in a number of circuses including Circus Gatini in Quebec, Canada and the Big Apple Circus in New York City. Chehaw Wild Animal Park, Albany, Georgia. Assisted in the development of a comprehensive elephant management program. Consulted with the keeper staff regarding elephant and keeper training. Helped to develop and implement safety procedures, and care and management protocols. Consulted with management regarding facility improvement. Creation and implementation of elephant programs at: Marriott’s Great America Theme Park; Knott’s Berry Farm Theme Park; Santa Barbara Zoo; Kansas City Zoo; Nashville Zoo; and Granby Zoo. Of the more than 50,000 charities the Sanctuary is one of only 1500 which have been certified as meeting or exceeding the rigorous standards set forth by ICA. Carol Buckley was selected as Guest of Honor for the 15th annual Genesis Awards in light of her work to bring media attention to her cause. Buckley, Carol. Tarra and Bella: An Elephant and Her Dog, Putman Publishers, 2009. Buckley, Carol. Just for Elephants, Tilbury House Publishers, 2006. Lyashchenko, K., et al. Tuberculosis in Elephants: Antibody Responses to Defined Antigens of Mycobacterium tuberculosis, Potential for Early Diagnosis, and Monitoring of Treatment. Clin. Vaccine Immunol. 13(7): 722-32 (Jul. 2006). Buckley, Carol. Travels With Tarra, Tilbury House Publishers, 2002. Buckley, Carol. Captive elephant foot care: Natural-habitat husbandry techniques. In: The Elephant's Foot: Prevention and Care of Foot Conditions in Captive Asian and African Elephants. Csuti, Blair; Sargent, Eva L. Bechert, Ursula S. (eds.). Iowa State University Press, Ames. 2001, i-viii. 1-163 p. Chapter pagination: 53-55. Buckley, C., D. Collins, C. Doyle, G. Johnson, J. Lehnhardt, & D. Redfox. Association Journal (EMA), III Indianapolis, IN. pp. 9-12. The Association of Sanctuaries (TAOS). Board Member, Elephant Managers Association, 1992. Officer, Elephant Managers Association, 1991. Steering Committee, Elephant Managers Association, 1990.